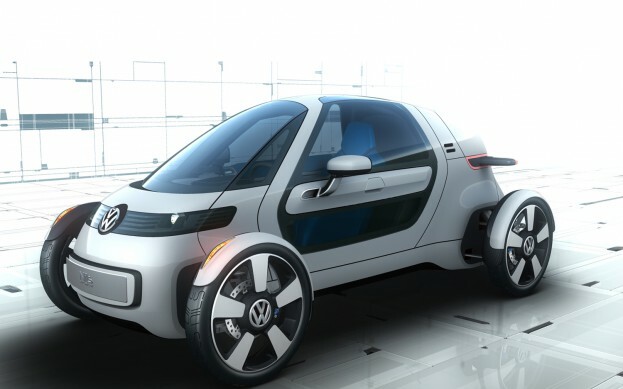 The tiny, single-seat Volkswagen Nils concept will make its public debut at the Frankfurt Motor Show later this month. It is supposed to offer sports car-like performance with zero emissions and silent propulsion. Volkswagen says the Nils concept is designed just like a Formula 1 racer. Much like Audi’s Urban Concepts, the single seat is mounted in the center of the car, the engine resides just aft of the driver, and the 17-inch wheels — wrapped in low rolling resistance tires — are placed outboard of the body. Entrance into the cabin is provided by polycarbonate gullwing doors, one placed on each side of the car.The body has few sharp angles and two small rear fins to help with aerodynamics. Never mind the F1 inspiration: the look is more akin to a narrow egg placed on wheels. The Nils is powered by a 15 kW electric motor – with a 25 kW over boost-like function – that draws juice from a 5.3-kWh lithium-ion battery. VW says that allows for a range of about 40 miles, and can be charged using a 230-volt outlet (the standard in Europe) in about two hours. According to Volkswagen, 73.9 percent of German commuters drive less than 15.5 miles on driving to work, making the Nils the right size and right range for urban commuters. The Nils weighs only 1014 lbs, thanks to all-aluminum construction, and is expected to accelerate from 0-62 mph in under 11 seconds. The electric motor pushes out around 95 lb-ft of torque and sends powerto the rear wheels through a one-speed transmission. To help quell nerves over the Nils’ diminutive size, the is equipped with a radar-based automatic braking system, a collision warning system, four disc brakes, and electronic stability control. The wing doors include a crash reinforcement section, and the aluminum space frame has been designed to act as a safety cell in the event of a collision. The Volkswagen Nils concept will make its debut at the Frankfurt Motor Show next month.